On occasion I need to define data science in a talk. If you want to provide an encompassing politically sensitive definition, it is no small task. I have not heard such a definition yet. 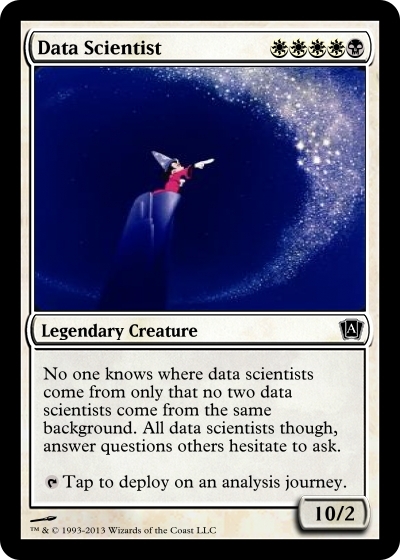 But taking a step back and working with my target audience, I was surprised how well a Magic card could capture some of the subtle complexities of data science. Data scientists mostly encourage growth, but on occasion advocate for the removal or archiving of a product. Data scientists are expensive and rare. Finally, data scientist have massive offensive power for tackling analysis and guiding company decisions, but poor defenses. It is particularly easy for talented data scientists to switch companies in the breeze.